This video was too amazing not to share. Hopefully this demonstration will lead the way to quantum computing and pretty much instantaneous communication through an unlimited distance. Very profound implications here. The number of calculations a quantum can do in one clock tick is staggering. This seems like it might lead the way into the next “internet”. The medium being one that we can’t even grasp yet.. perhaps dark matter? This might mean instantaneous communication between every human at the same time via thought. In a side note, physicists have also invented an entanglement filter. The filter allows two protons through only if their states are the same. This observation supposedly does not change the state of the entangled photons. via Quantum technologies move a step closer with the demonstration of an ‘entanglement’ filter. “Our system has the potential to form the basis for a large-scale ‘quantum repeater’ that can network quantum memories over vast distances,” says group leader Christopher Monroe of JQI and UMD. “Moreover, our methods can be used in conjunction with quantum bit operations to create a key component needed for quantum computation.” A quantum computer could perform certain tasks, such as encryption-related calculations and searches of giant databases, considerably faster than conventional machines. The effort to devise a working model is a matter of intense interest worldwide. 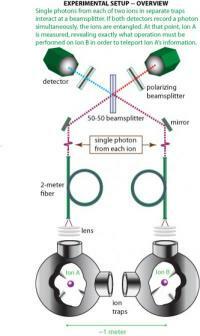 via Long-Distance Teleportation Between Two Atoms: First between atoms 1 meter apart.